Holiday season can be one of the most expensive times of the year. When we are in celebrating mode, stressing about finances is the last thing we want to worry about. Holidays should be something we look forward to; the chance to connect and relax with family and friends. But it can quickly be a drain on the savings fund account if you do not plan ahead. It is never too early to start saving for the holiday season. The earlier you start putting money aside, the less financial strain you’ll experience come January / February. Allocate a specific holiday budget to avoid putting gifts, food and other Christmas goodies on a credit card. Anything that you put on a card during these peak months can come with higher interest rates (if not paid off when the balance is due), which will leave a hole in your account. Even putting $50 aside each pay check in the lead up to the holiday season can make a huge difference. Review your spending habits for last year now too and work out ways you can change them for the better. 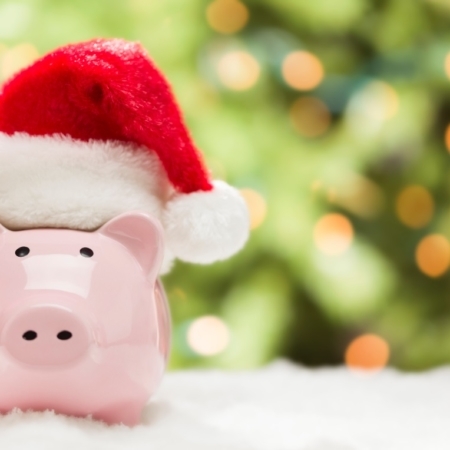 Calculate the Christmas budget and look for ways to cut costs and reduce the amount you usually spend. Your wallet will thank you for it come the New Year! Just because Santa buys Christmas presents for the whole world, doesn’t mean you have to. Review your shopping list and cut it down where you can. Focus only on your immediate family and close friends. Running a Secret Santa within your family or group of friends will eliminate the need to buy for everyone and offers a fun way for each person to receive a gift without breaking the budget. Set a limit everyone can commit to. You can also get creative with your gift giving to cut down costs. If you feel the need to have a long ‘nice’ list for people to buy for, only buy a gift for the key people. For those that made the cut, bake some fresh cookies and bundle them up in little gift bags for them to enjoy. Christmas shouldn’t be about spending wars and competitions – it’s the thought that counts at the end of the day. Giving family and close friends your time over the holiday season can be a gift in itself too. The same way setting aside savings as early as possible cuts down costs, shopping early can give your wallet a huge break. Start looking for ideal presents for people in the months leading up to December. Buying gifts as you find them during the year saves a lot of last minute shopping stress and avoids making big spends during the holidays when you notice the dent in your bank account more. Shopping online will also eliminate a lot of the spending costs. You’ll need to get onto this as early as possible though to avoid the Christmas post rush and ensure everything arrives on time. Get in the habit of leaving your credit card at home to eliminate big purchases. Spreading out your spending will help to escape the credit card trap too as you won’t be buying as many things at once. If you have someone in the family that always buys fancy presents because they earn more money than you and your spouse, this doesn’t mean you need to return the favour. Consider your financial situation (and yours only) to determine the best budget for your needs. Following suit with bigger spenders in your family or group of friends won’t help your situation. Everyone has experienced tight budgets before and the holiday season shouldn’t be about impressing anyone through the value of what you buy. If there are any doubts as to whether those on your list will appreciate less expensive presents, put yourself in their shoes and think about what they would buy you if the situation was the other way around. Remember personalised gifts over expensive gifts will go much further. Now is a good time to sit down with the family and set guidelines for spending. Educate your children as to how much is appropriate to spend, what they can expect and what they can do to help others through the holiday season. It can be worth giving them a few extra chores to save more for spending money, depending on their age. If last year’s spending habits went through the roof, use this time to establish better financial goals the whole family can comfortably meet. Set boundaries on how much to spend on each child to resist the temptation to keep buying. You can even add some family outings to the present list to save on the spending. For example; games, movie tickets or a fun day out with all the kids can go a long way and prevent blowing the budget. With the right planning and a dash of creativity, your holiday season can easily be financially stress-free. Making smart money choices and focusing on what’s really important during the holidays (being surrounded by the ones you love) will eliminate any unnecessary spending habits and set you up for an even better New Year. Peta Winkless is an Authorised Representative and credit representative of AMP Financial Planning. Blueprint Planning Pty Ltd (ABN 78 097 264 554), trading as Blueprint Wealth, is an authorised representative and credit representative of AMP Financial Planning, Australian Financial Services Licensee and Australian Credit Licensee.